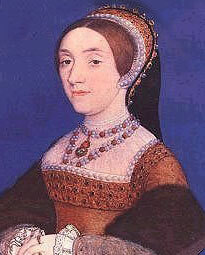 Catherine Howard (c.1523 (1523) – 13 February 1542 (1542-02-14)) wis Queen o Ingland frae 1540 till 1541, as the fift wife o Henry VIII who referred tae her as his "rose wioot a thorn". ↑ The portrait, believed tae be Catherine Howard, haes been persuasively identified through the jewels on her dress, which match those in her inventory. This page wis last eeditit on 25 Mairch 2017, at 16:04.